Glass Ceilings in the White House | American University Washington D.C. 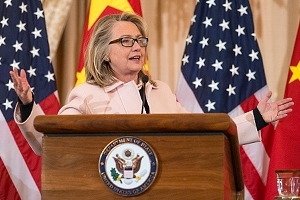 In 2013, Secretary of State Hillary Clinton announced a partnership between AU and the 100,000 Strong Foundation. Professor Jennifer Lawless says Clinton's leadership experience means that her gender will not likely affect her electability. A Salon article criticized Scarborough’s tweet as “subversively sexist,” and predicted the gender battles to come if Clinton is the nominee. The debate has already started, with some commentators wondering if Hillary Clinton—the first woman to be a major party nominee, if she defeats Sanders—will be treated unfairly in a general election. American University School of Public Affairs professor Jennifer Lawless is a leading expert on women and politics, and she’s well-positioned to gauge the impact of gender on the presidential election. And Lawless’s analysis might surprise some people: In all likelihood, Hillary Clinton’s gender will not markedly affect her electability. Lawless offers two reasons for making this assessment. First, Clinton is a household name who has already spent decades in public life. She’s been first lady, a U.S. senator, and secretary of state. In addition, Lawless says that voter gender stereotyping has largely fallen by the wayside. With a polarized electorate, party identification is a much better determinant of voting behavior. “Whether candidates have a D or an R in front of their name is way more important than whether they have a Y chromosome in their DNA. That’s not to say that gender won’t be relevant on the campaign trail, but it does suggest that it certainly would not be a significant impediment to Hillary Clinton,” she says. Yet Hillary Clinton’s historic campaign isn’t happening in a vacuum. The current Republican frontrunner is Donald Trump, whose alpha dog campaign persona is appealing to aggrieved white men. “For a segment of the population there is some degree of gender resentment, where white men might feel like their progress has been stunted by opportunities afforded to women, or people of color. And that’s consistent with some of Trump’s messages,” she says. Yet preliminary analysis shows that gender resentment has also led to support for GOP candidate Ted Cruz, she adds. So could Hillary Clinton benefit from running against a candidate accused of blatant misogyny? This is a bit complicated. There’s already a gender gap between the two political parties, with more women voting for Democrats. Recent male Democratic presidential candidates, Barack Obama and John Kerry, have struggled with white male voters—Hillary Clinton would also face an uphill battle with that demographic. However, Lawless sees some scenarios where being a woman could help her. During the 1990s, on the campaign trail and as first lady, Hillary Clinton certainly stirred passions. Many Americans feared a “co-president,” and her sarcastic remark that she could have “stayed home, baked cookies and had teas” turned off some conservative moms. Pundits have pointed out that Clinton has evolved in her family presentation, and now she frequently talks about being a grandmother. “She’s a strategic politician who understands and learns from her mistakes,” says Lawless. Lest this seem like patriarchal America insisting that candidates assume proper gender roles, Lawless says this can also make a candidate relatable. “People want candidates who have a sense of empathy and a sense of integrity. And one of the best ways to demonstrate your empathy and integrity is by invoking your family,” Lawless says, adding that Hillary’s much publicized marital issues place parameters on how she does that. Throughout Hillary Clinton’s career, there have been many comments about her pantsuits, hair, and appearance. That is why tweets about her smile or shrill voice strike such a nerve. Aren’t women routinely subjected to media bias and ridicule for their looks and demeanor on the campaign trail? Based on recent research by Lawless, the answer is no. Lawless explores this issue in a forthcoming book, Women on the Run, co-authored with George Washington University professor Danny Hayes. For the 2010 and 2014 congressional elections, they analyzed about 11,000 newspaper articles (by far the primary means of covering House campaigns) and discovered that male and female campaigns received similar coverage. “In terms of volume of coverage, the traits and issues that they were associated with, and mentions of their gender and personal background, there were virtually no differences,” she explains. In examining almost 500,000 campaign ad airings in 2010, and some 56,000 tweets that candidates sent in 2014, they also found that the substance of male and female campaigns were quite similar. They conducted national surveys and, again, learned that voters didn’t view male and female candidates differently. Their follow-up discussions with campaign managers and local journalists jibed with this reality. Yet in a paradox, they found that a strong majority of people still think women face an uneven electoral playing field. “When somebody yells ‘iron my shirt’ at a Hillary Clinton rally, or when Kirsten Gillibrand’s book about what it’s like to be in the Senate is covered almost exclusively in terms of the couple of male senators calling her fat, that translates into people’s perceptions. And it makes them think that this must be what it’s like for women everywhere,” Lawless explains. These are isolated—if high profile—incidents, she says, but that misperception is one reason why women are less likely to run for office in the first place.